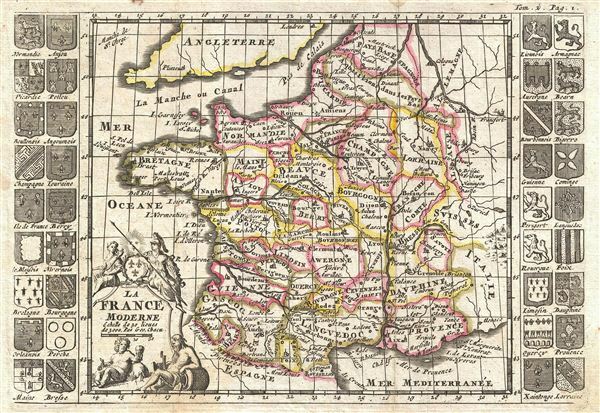 An uncommon map of France issued in 1700. The map is surrounded by thirty-six armorial crests representing various French provinces. A decorative allegorical title cartouche appears in the lower left quadrant. At the opening of the 18th century France was one of the dominant powers in europe. With a population of nearly 19,000,000 people under a single government and ample arable farmland, France dominated most of europe socially and economically. This map is ascribed to one ‘Chacu' or possible ‘Chacune' of whom we have been able to identify no specific references. It was prepared for Martineau du Plessis' Nouvelle Geographie, published in 1700.